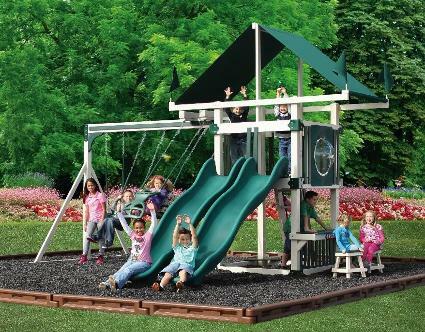 Stock swing set # SWV 3SK 17 - Model KC-7 Deluxe, Woodgrain vinyl with green accents and accessories. This display clearance would still retain the warranty from the vendor, however since it is a display model it is sold As-Is. We require 8' wide truck access for delivery and a level area on which to place the set. Delivery is not included. A site inspection would be required to confirm delivery delivery access for this stock set.